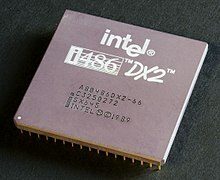 An Intel 80486DX2 CPU, as seen frae abuin. A central processin unit (CPU) (umwhile an aa referred tae as a central processor unit) is the haurdware within a computer that cairies oot the instructions o a computer program bi performin the basic arithmetical, logical, an input/ootput operations o the seestem. The computer industrie haes used the term "central processin unit" at least syne the early 1960s. Tradeetionally, the term "CPU" refers tae a processor, mair specifically tae its processin unit an control unit (CU), distinguishin thir core elements o a computer frae freemit components sic as main memory an I/O circuitry. The form, design, an implementation o CPUs hae cheenged ower the course o thair history, but thair fundamental operation remeens awmaist unchynged. Principal components o a CPU include the arithmetic logic unit (ALU) that performs arithmetic an logic operations, processor registers that supplee operands tae the ALU an store the results o ALU operations an a control unit that orchestrates the fetchin (frae memory) an execution o instructions bi directin the coordinatit operations o the ALU, registers an ither components. Maist modren CPUs are microprocessors, meanin thay are conteened on a single integrated circuit (IC) chip. An IC that conteens a CPU mey an aa conteen memory, peripheral interfaces, an ither components o a computer; sic integratit devices are variously cried microcontrollers or systems on a chip (SoC). 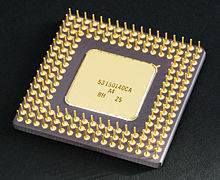 Some computers employ a multi-core processor, that is a single chip conteenin twa or mair CPUs cried "cores"; in that context, ane can speak o sic single chips as "sockets". Array processors or vector processors hae multiple processors that operate in parallel, wi na unit conseedert central. Thare an aa exists the concept o virtual CPUs that are an abstraction o dynamical aggregatit computational resoorces. ↑ Envos Corporation (September 1988). "1. INTRODUCTION". 1108 USER'S GUIDE (PDF) (Manual). Envos Corporation. p. 1. Retrieved May 24, 2012. ↑ Weik, Martin H. (1961). "A Third Survey of Domestic Electronic Digital Computing Systems". Ballistic Research Laboratory. ↑ Thomas Willhalm; Roman Dementiev; Patrick Fay (December 18, 2014). "Intel Performance Counter Monitor – A better way to measure CPU utilization". software.intel.com. Retrieved February 17, 2015. This page wis last eeditit on 8 Mairch 2018, at 18:36.